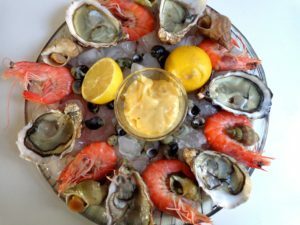 A shellfish platter can be as extravagant or simple as you care to make it, and may be served as a starter for a festive meal or as a main course, followed by salad, cheese and/or dessert. The other essentials are bread and a good bottle of crisp white wine. The platter pictured above features oysters, gambas (aka large shrimp, or prawns), bulots (whelks, or large sea snails) and bigorneaux (winkles, or small sea snails). Also on the platter are lemon halves and a ramekin of homemade mayonnaise. The shellfish is set on a plate of crushed ice. In the steps below, I will explain how to create an identical platter. Shellfish platters are most commonly served in the winter months in France. Other types of shellfish that may appear include tourteau or araignée (crab), homard (lobster), langouste (rock lobster, which have large tails and are virtually clawless), langoustines (scampi), palourdes or praires (clams), moules (mussels) and oursins (sea urchins). The key to a successful shellfish platter is obviously the freshness of the ingredients. The best plan is to shop on the very day when you plan to serve the platter. 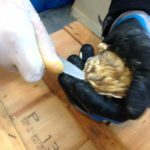 Opening oysters can be a chore — have the fishmonger do it for you if will be serving them within a couple of hours. But the rest of the preparation is quite easy. When serving a shellfish platter, be sure to place a recipient on the table where shells may be discarded. A large salad bowl will do the trick. If you happen to have small oyster forks, use them. If not, regular forks are fine. The bread and butter should be set out on the table before you arrive with the platter, as should the chilled white wine. Place the platter in the middle of the table and allow guests to serve themselves. It is a convivial occasion. The ingredients below duplicate the platter pictured above and will serve two people as a starter. For a main course for two, double the ingredients, or improvise. Creating a shellfish platter is fun, and will delight your guests. Hold the oyster in your left hand with the point of the shell facing you. Place the knife at the edge of the shell between your middle finger and your ring finger. Insert the knife at an angle, wiggling it back and forth to work your way inside the tightly closed shell. 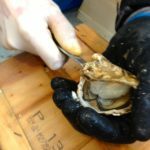 When it cuts through the muscle, the shell will give and you can open the oyster. Delicately lift off the top and discard it. Drain the oyster. 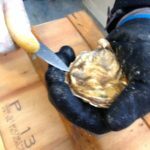 This not only removes bits of shell that may have fallen in, but also allows the oyster to replace its liquor (première eau) with a less salty liquid (seconde eau). Cut beneath the oyster to loosen it for easy eating. Refrigerate until serving. Please note: An oyster knife is not essential for this operation. If you like, you may rinse the oysters under running water before opening them to remove any bits of grit or sand. When ready to serve, place the opened oysters on a bed of crushed ice (see below). Cut your lemon in half and place on the platter. In France, some people prefer their oysters with a sauce made of red wine vinegar and minced shallot. For two people, use 1/4 cup (60 ml) of vinegar and one finely minced shallot. Serve in a ramekin with a small spoon. Serve the oysters with thinly sliced bread and salted butter. In France, thinly sliced rye is traditionally used, but this is not essential. While the French use unsalted butter on most occasions, this is the exception: salted butter is de rigueur. Eating the oysters: Begin by buttering a slice of bread. Add a drop or two of lemon juice or vinegar sauce to an oyster (if it wriggles, it is good to eat; if not, you’re taking a chance). Do not overdo it with the lemon or vinegar to avoid drowning the oyster’s taste. Let the oyster slip into your mouth and enjoy a burst of briny flavor. Follow up with a bite of buttered bread and a sip of well-chilled, crisp white wine. For maximum flavor, buy the gambas or shrimp uncooked if at all possible. They will be gray in color. Bring a large pot of water to a boil. Add the gambas. Cook until the shells turn bright pink. Drain. Refrigerate until serving. Prepare some homemade mayonnaise — click here for the recipe. When ready to serve, place the gambas on your platter of crushed ice with lemon halves and a small bowl of mayonnaise. In France, gambas or shrimp are served whole on a shellfish platter. To eat them, break off the heads, pull off the feet and snap off the shells. Sprinkle lightly with lemon juice, dip in the mayonnaise and enjoy. These are often sold cooked in France. If this is not the case, rinse the whelks to remove any sand and immerse them in a basin of water for 30 minutes. Drain. Bring a large pot of water to a boil. Grind in some black pepper. Add the whelks and boil for 20 minutes. Drain and refrigerate until ready to serve. Add the whelks to the platter. Use a toothpick or sturdy stick pin to remove them from their shells. Dip in the mayonnaise and enjoy. Bring a pot of water to a boil. Grind in some black pepper. Add the winkles and boil for 5 minutes. Drain and refrigerate until ready to serve. Add the winkles to the platter. Use a toothpick or sturdy stick pin to remove them from their shells. Dip in the mayonnaise and enjoy. Making crushed ice is surprisingly simple. You will need one or two trays of ice cubes, a sturdy plastic bag and a hammer. Place the ice cubes in the plastic bag. Remove as much air as possible from the bag and tie a knot. Place the bag on the floor — on top of a rug is a good idea to prevent damage to the floor — and hammer it until the ice is crushed. Place in the freezer until ready to serve. Scatter the crushed ice over your platter as a bed for the shellfish. Assemble the platter and prepare for applause.